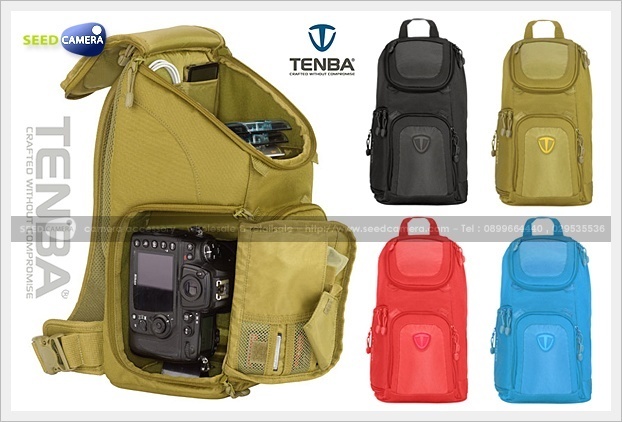 Capacity : 1-2 D/SLRs, 3-4 lenses, flash and accessories. SLR with mounted 300mm telephoto lens (in long lens configuration). The Sling is a single-strap, quick access bag that swings around for fast shooting without removing the pack. Tenba's exclusive design converts to a lightweight long-lens bag for top-loading your mounted super telephoto lens (up to 300mm f/2.8. Think of it as a backpack without the bulk, or a shoulder bag without the strain. The Vector Sling will fit a regular sized SLR without the added depth of a vertical grip/booster (actually 2 bodies if necessary), plus lenses, accessories.